With over 35 years of experience in the food safety industry we offer the best food safety training available. Our training is ANSI accredited, and approved by the State of Illinois, California, Arizona, Texas, & more. Train Anytime Anywhere Our online training programs are designed to be fast and convenient. Enjoy 24/7 access to your training account from anywhere that has Internet access, even your smart phone or tablet! No hassle training allows you to complete the entire training program, take the exam, & download your certificate of completion all from your online account. Corporate Rates We offer corporate rates & accounts to easily manage your company's training needs. View our training Terms & Conditions for technical requirements. Find more information for California Food Handler Training here. Find more information for Illinois Food Handler Training here. 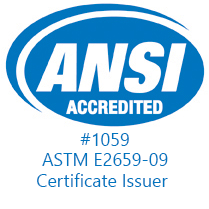 This training is ANSI accredited under ANSI Standard ASTM E2659-09. The State of Illinois requires this training is provided by ANSI accredited organization. It's Required "...all certified food service sanitation managers employed by a restaurant must receive or obtain training in basic allergen awareness principles within 30 days after employment and every 3 years thereafter." Find more information for Illinois Food Allergen Training here.